In a post today, materials physicist Charles Anderson PhD explains why the basis of climate alarm, back-radiation and the Trenberth Earth energy budget, are fallacies. Basic physical calculations show that if the Trenberth budget was correct, the average temperature of the Earth would be much warmer than observations. The usual greenhouse gas calculation such as is offered up by the various Trenberth diagrams is highly dominated by the radiative transport of energy in the Earth’s atmosphere. It leads to an unreasonable result for the situation I am going to describe here. where the 0.5 is the half of any IR absorbing molecule radiation which was not radiated into space and is radiated toward the surface. The fraction f is the fraction of the IR energy lost by the surface and absorbed by an IR absorbing molecule which is re-emitted before collisions have dissipated the energy absorbed. The fraction f is much less than one because most often the IR absorbing molecule undergoes collisions with other molecules and transfers much of the IR absorbed energy to other molecules before re-emission occurs. These other molecules are rarely water or CO2 or other IR emitting molecules, so that energy is not returned to the surface as IR radiation. Thus much of the surface emitted IR radiation is dissipated to the 99.97% of the atmosphere molecules which are nitrogen, oxygen, or argon and are not IR emitters. Let us estimate the value of f. At sea level, the mean gas velocity is 459 m/s, the mean free path or distance between collisions is only 6.6 x 10^-8 m or 66 nm, and the collision frequency is 6.9 billion/s. At an altitude of about 4000 m, the radiative transfer of energy competes about evenly with transfer by collisions. At 4000 m altitude, the frequency of gas molecule collisions is about 4.4 billion/s. We can use the equivalency of energy transfer by radiation and gas molecule collisions at the 4000 meter altitude to estimate the fraction of energy transfer by radiation of the total of energy transferred by radiation plus gas molecule collisions. At sea level, energy transfer by radiation is equivalent to about 4.4 x 109 collisions per second, so the fraction of energy transferred by radiation is about 4.4/(4.4 + 6.9) = 0.39 of the total by gas molecule collisions and radiation. This suggests that about 1.5 times as much energy is transferred by gas collisions as by radiation at sea level. But, it does not follow that simply because this much back-radiated IR is incident upon the surface that it will be absorbed by the surface. 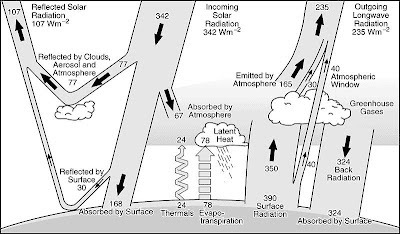 During the roughly 8 hours of a day when the surface is warming under increasing sunlight and with a 2-hour lag for warming the ground, water, or air in a vicinity, none of this radiation may be absorbed, except when a cloud casts a shadow on a part of the area or at such points under the shadow of a tree of some such object. The absorbing ground has to be cooler than the ground from which the photon was emitted and subsequently absorbed by an IR-absorbing molecule in the atmosphere. During the remaining cooling hours of the day, roughly 16 hours, the surface is more likely to absorb such back-radiated energy. As a mean value for re-absorption of IR back-radiation, you have claimed the figure of 0.95, which I have seen claimed by others. I believe that value is much too high. 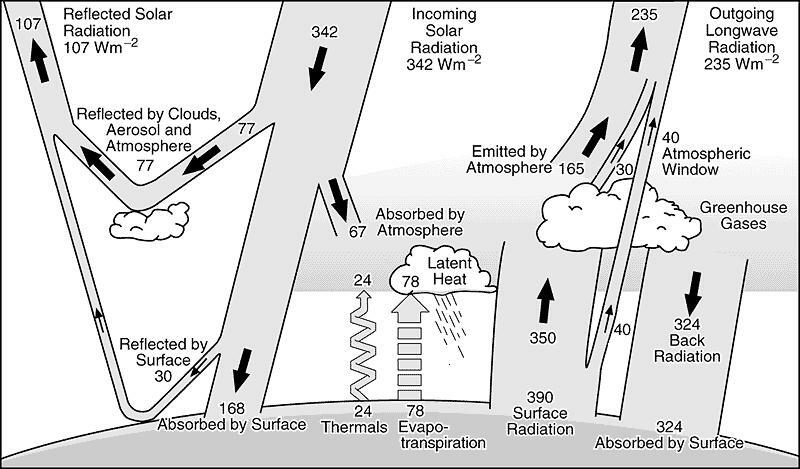 According to this diagram, 67/ 342 = 0.196 of the incoming solar radiation is absorbed by the atmosphere. 77/342 = 0.225 is reflected by clouds and aerosols. The surface reflects 30/(30 + 168) = 0.152 of the solar radiation incident upon the surface. Thermals cooling the surface dissipate 24/168 = 0.143 of this incident radiation. Now let us consider a midday calculation of the surface and do so where there is no cloud cover and where it is so dry that there is no evapotranspiration. What kind of surface temperature will we have. Since there are no clouds and I think clouds are the better part of the summed cloud and aerosol effect, let us assume the aerosol effect alone is 0.08. The midday radiation incident on the upper atmosphere is 1367 W/m^2. Note that at midday, the incident radiation path length through the atmosphere is shorter than it is for the average daily values normally used, so losses in the atmosphere should be lower than these numbers. I will use them nonetheless. Now this is clearly much too hot and implies that even the addition of this upper limit of back-radiation which is much smaller than the back-radiation in the Kiehl-Trenberth diagram and energy budget is not physical. which is nonsense. Of course you might say that the thermals would be different and if I have no absorbing IR gases, then I certainly do not have water evaporation and movement. This perhaps is a muddled situation. The temperature of the body is determined by the incident radiation on it. The basic approach of the Kiehl-Trenberth diagram to radiation is nonsense. The energy budget is a farce based on bad physics. Indeed, when challenged on this issue, many proponents of man-made catastrophic global warming back down and say that the General Circulation Models are calculated primarily as air and water vapor circulation models and are not really consistent with the several variations of the Kiehl-Trenberth Energy Budget. Yet it is such fallacious budgets that the public has been fed as the basis for the claim that there are substantial effects on the Earth's surface temperature due to man's emissions of CO2. Government websites have been full of these energy budgets, as have college classes. For their part, the range of results in the GCM computer models is too large to be consistent with the idea that climate science is settled and everyone agrees that it is understood. An improvement to the K/T chart is shown at the pdf made public 6/21/11.